Did you know that Chile is the biggest producer of Cabernet Sauvignon behind France? Neither did we before visiting the Central Valley region of Chile, which includes the smaller valleys of Maipo, Colchagua, and Maule. Maule Valley was our first stop in Chile and one of the oldest wine regions in the country. Read about our experience here. 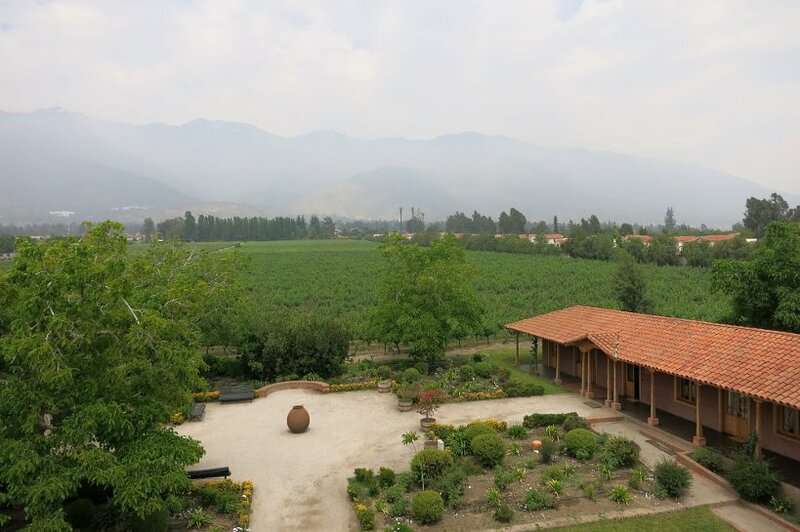 With experts calling Maipo Valley the best wine producing area in Chile, we chose to visit three vineyards that were easily accessible from Santiago. Join us on a Chile Wine tour in Maipo Valley. 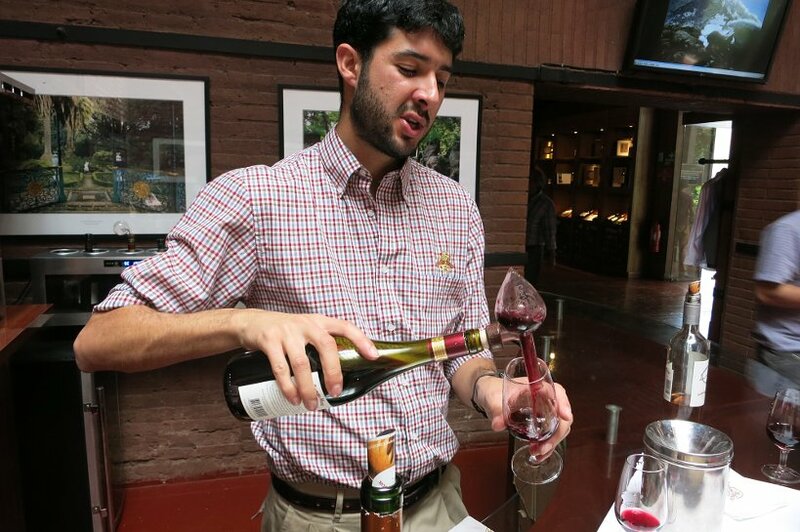 As we continue our quest to discover local specialties, we decided to explore the wine scene in Maipo Valley, home to some of the country’s most prestigious wines. This valley is celebrated for its Cabernet Sauvignon though you will find other grape varieties including; Merlot, Cabernet Franc, Syrah, Chardonnay, and Sauvignon Blanc. On this trip, we visited Concha y Toro, Latin America’s biggest producer. 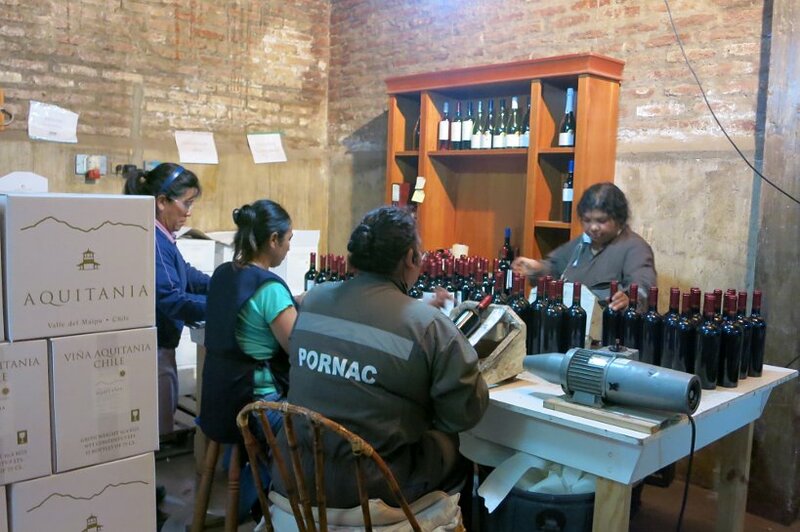 Aquitania, a smaller boutique making high-end wines and finally, Cousiño-Macul, an older family run winery. 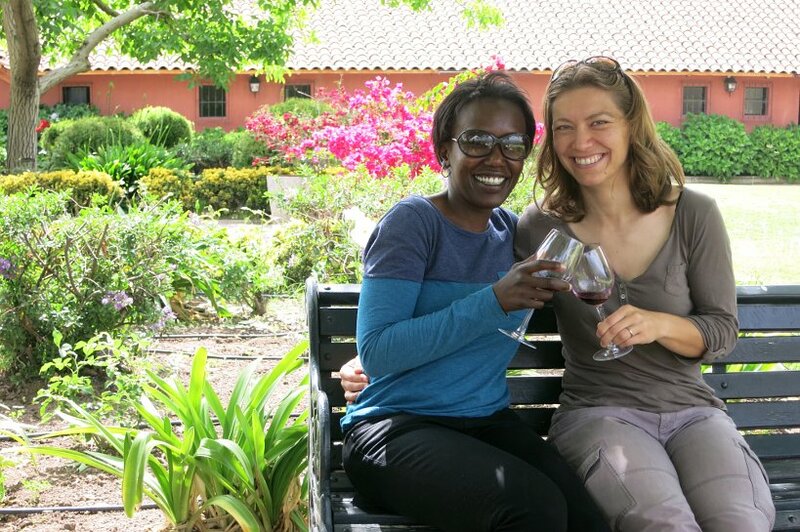 The experiences at the wineries were all different and we invite you to read on for more. Concha y Toro is the biggest vineyard owner in the world. This means that Concha y Toro owns over 10,750 hectares of vineyards. This includes 9,133 hectares in Chile (not just in the Maipo Valley), 1,154 hectares in Argentina and 463 hectares in the U.S., where it owns Fetzer and Bonterra wines. 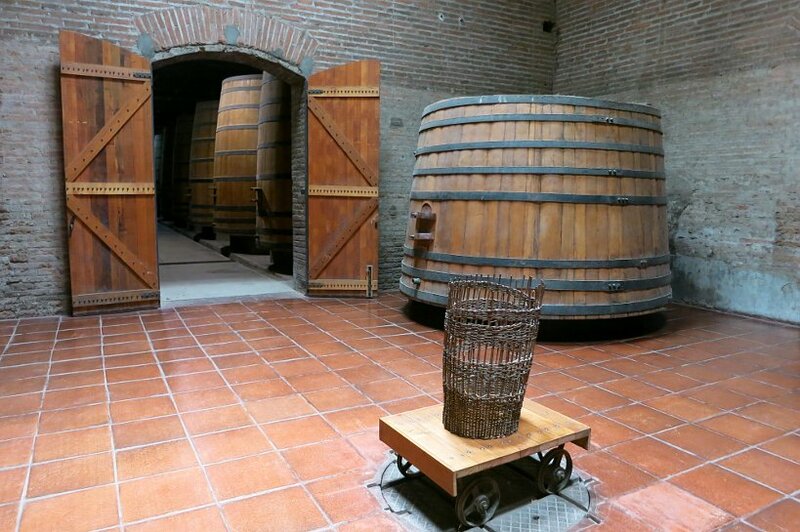 As the largest producer of wines in Latin America, the experience at the vineyard reflected the industrial size of the production. Our tour, which we highly recommend you book in advance started at 4 pm and was offered in English. There were about 18 other people taking the tour with us from Brazil, South Korea, the U.K., India, and the U.S. 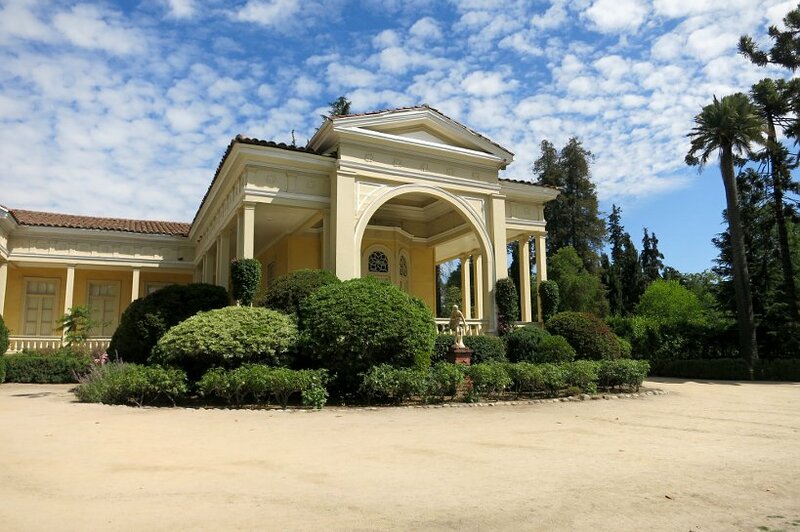 The tour began with a visit to the beautiful estate where we also got a chance to learn about the history of wine. Concha y Toro was established in 1883 by Don Melchor, who was a successful businessman who regularly traveled to Europe. He took cuttings from the vineyards in Bordeaux and brought them back to his estate in Maipo Valley, where he planted them. Today, Concha y Toro is a publically traded company that can be found on the NYSE (symbol VCO). The family retains 5% of the shares. 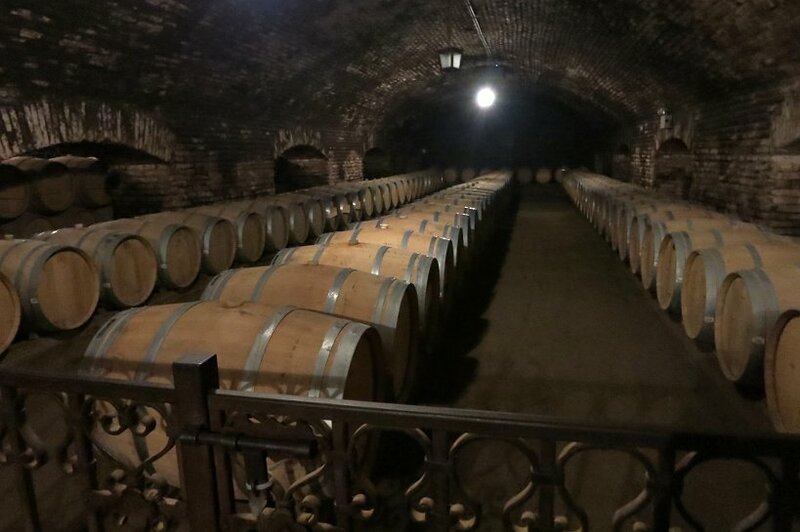 Our tour continued to the original cellars named “Casillero del Diablo” (the devil’s cellar). Here we listened to a rather cheesy production of a myth about this line of wines. Apparently, Concha y Toro himself spread the rumor that the devil lived inside of his wine cellars. This was to make people afraid to steal from his wine cellars, which apparently had been in a problem in the past. Concha y Toro makes several different brands of wines and the most famous is the value-priced wines of Casillero del Diablo. On our tour, we tasted 3 wines from their “Fine Wine Collection.” We started out with a Chardonnay and Carménère from the Terrunyo line and a Cabernet Sauvignon from the Marques de Casa Concha line. To get the most out of the Concha y Toro experienced we signed up for a Marques de Casa Concha tour. 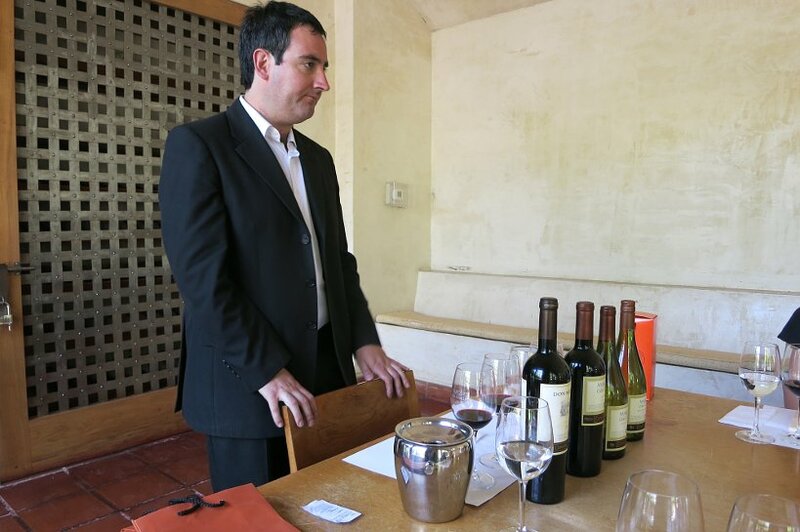 It was more expensive than the standard tour and included a deeper experience into Chile wines with a sommelier. After the general tour, we were led to a room where the “grand tasting” was held for those who signed up for it. This experience was unique in a couple of ways. First, there were only 5 of us participating in the tasting. 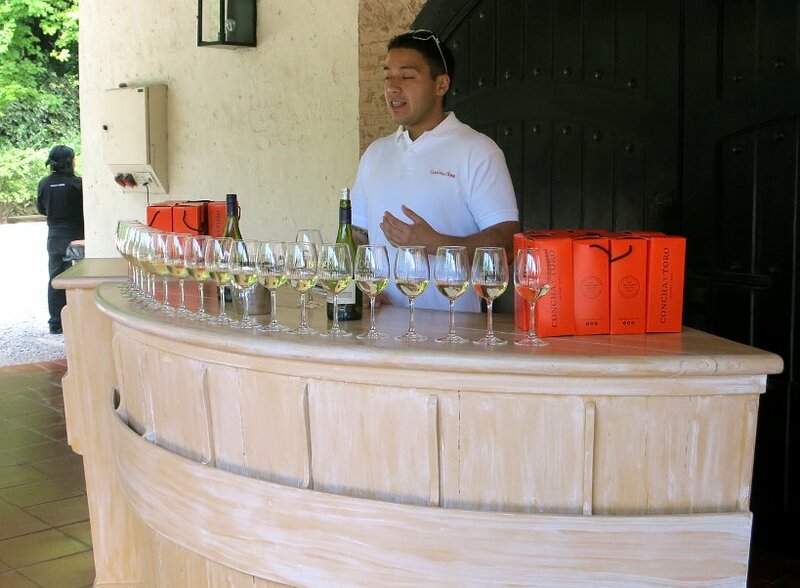 Secondly, the tasting was run by a trained sommelier – named Christian. Finally, we had cheese, bread and ham to accompany this tasting. 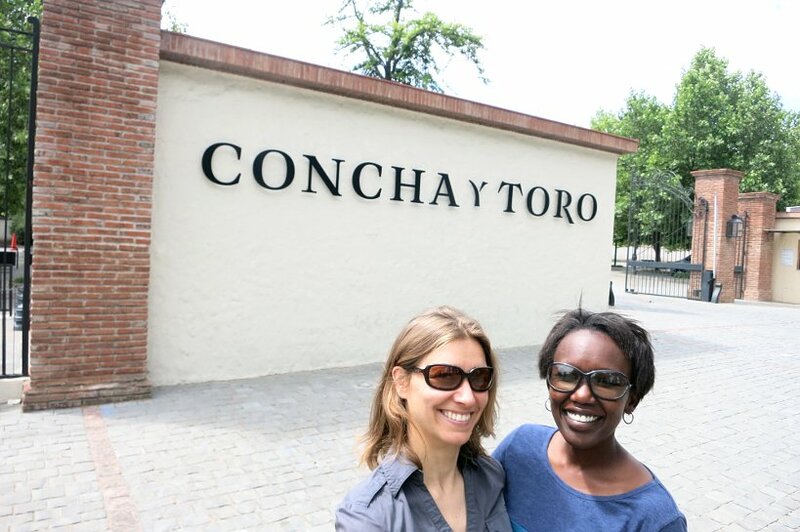 We were not blown away by the wines from Concha y Toro. We liked some more than others, but overall preferred the wines from the Marques de Casa Concha tasting than the wines from the Terrunyo line except for the Carménère. The Chardonnay (Marques de Casa Concha, 2013) was delightful. The Merlot (Marques de Casa Concha, 2013) was complex and easy to drink. Our final wine tasting was from the super premium brand Don Melchor, and it was a Cabernet Sauvignon 2008. We both found this wine harsh and full of tannins and were surprised to learn that it retails for USD $150. When you visit the largest wine producer in the world, there are certain expectations that come with that. 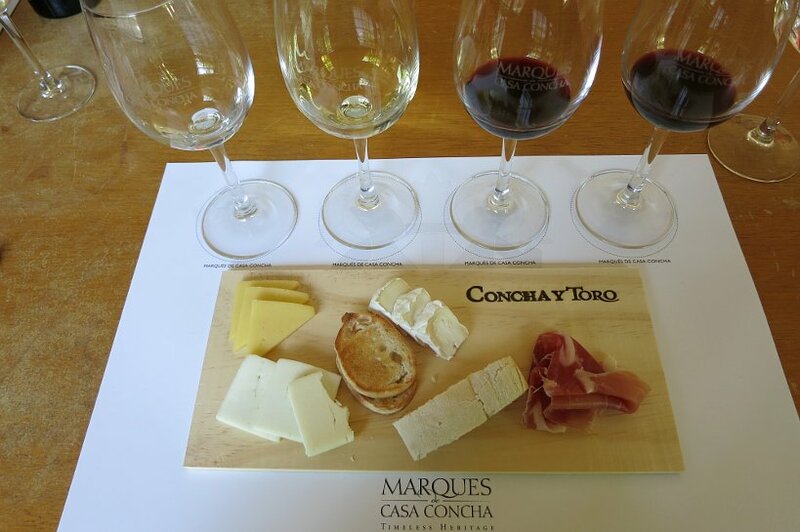 The cost of our tour was more expensive than the standard tour because we opted for the Marques de Casa Concha tasting. The property is beautiful and there is a wine bar/restaurant on site. A fascinating experience and one worth exploring. Viña Aquitania was by far our favorite winery and one that we highly recommend you check out. It is easy to get to via public transportation (see below for directions) and worth the one-hour commute. The vineyard is a boutique vineyard owned by four owners, one Chilean three French. Located at the bottom of the Andes mountain, it makes for an impressive view. 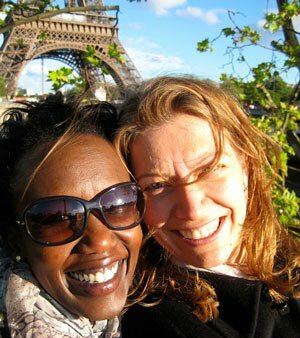 The tour started off with a climb up into their tower overlooking their entire property with amazing 360-degree views. The tour continued with visits to the fermentation room, cellars and labeling area. 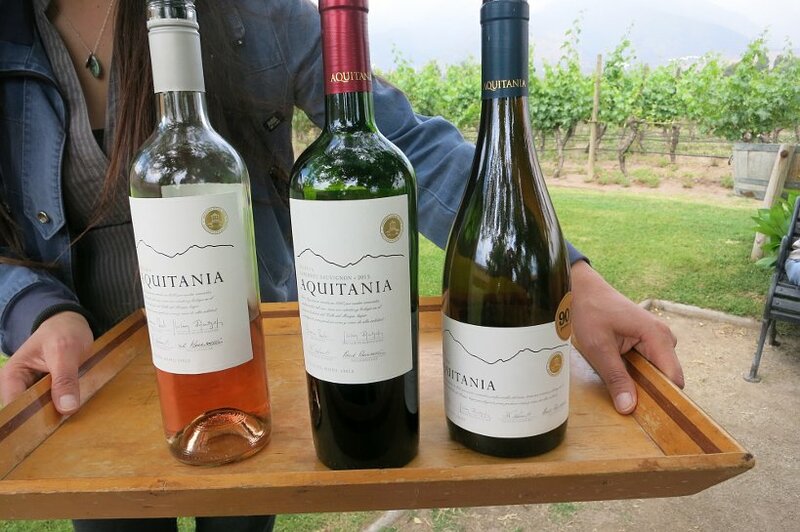 Here we learned the magic behind Aquitania Chile wines and what makes them so special. According to our tour guide, the idea behind Aquitania is “to produce high quality wines in low quantity rather than lots of wine with mediocre quality.” The harvest is done by hand in April/May. While we were on our tour we got to see the labeling being done by hand, underscoring the artisanal wine production process. 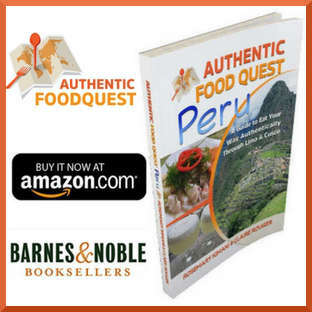 Only 15,000 boxes are produced each year with 80% reserved for exportation primarily to Brazil and the U.S.
After the tour, we were led to the gardens underneath a gorgeous Walnut tree overlooking the amazing Andes. Here we got to try 3 Chile wines. One Rosé, one Syrah and the signature wine from the vineyard – Cabernet Sauvignon. We really enjoyed these wines and particularly the Rosé (2014). We ended up taking a bottle with us. The Cabernet Sauvignon (2013) and Syrah Reserva (2014) were also smooth, rich and easy to drink. While we enjoyed both reds, we really liked the Cabernet Sauvignon. Either way, you can’t go wrong with the Chile wines from Viña Aquitania. We really enjoyed the experience at Viña Aquitania. Our tour guide was very knowledgeable about the wines as well as the different wine growing regions in Chile. It is a small winery, so the tour goes by quickly. However, the reward of the delicious wines in the garden makes it worth visiting. This is a must visit winery in Santiago. Cousiño Macul is located about 20 minutes walk from Viña Aquitañia, so we were able to hit both wineries on the same day. 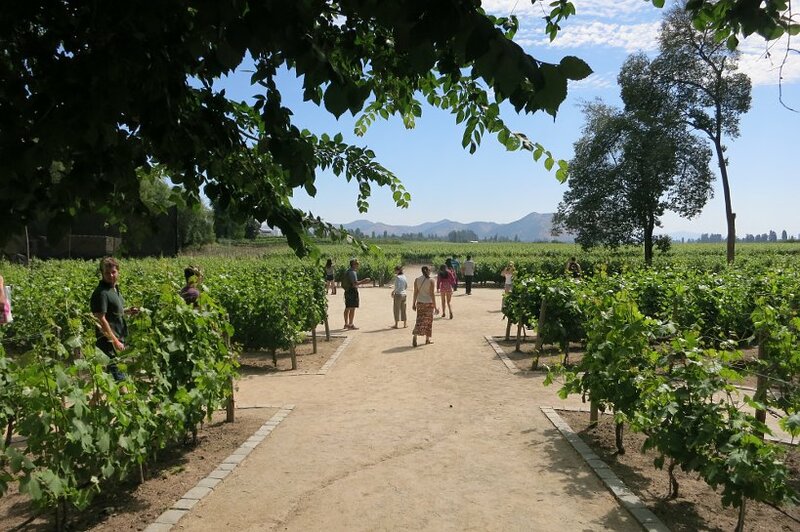 We chose to visit this winery because it was easy to get to and close to Viña Aquitania. 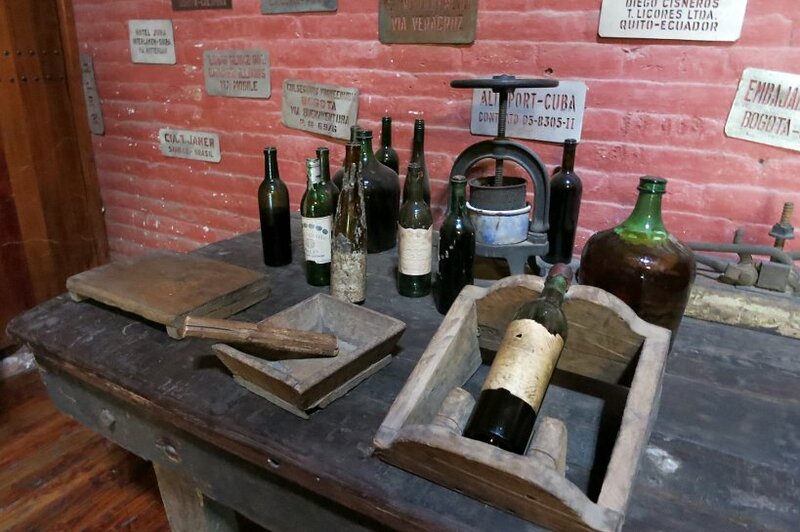 It is also one of the oldest wineries in Maipo Valley, built in 1870. The tour ended up being a “museum tour” highlighting the “old” winemaking process. 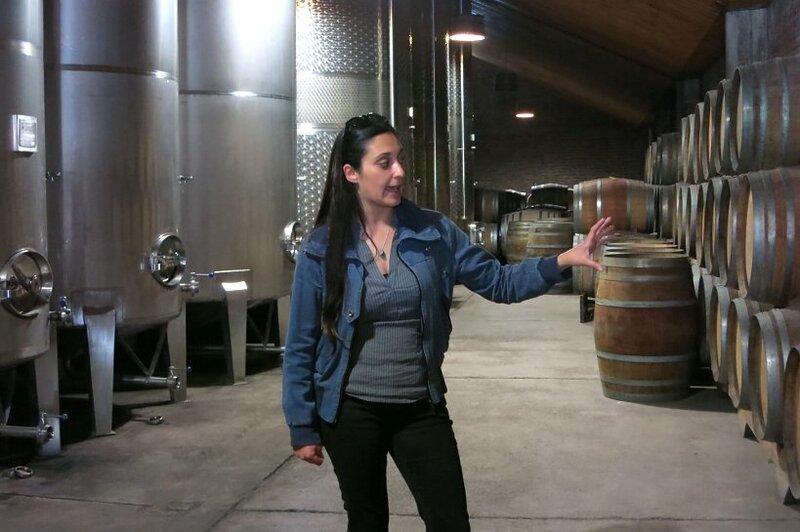 We started with a visit to the old vines, which was followed with the antique wine cellars and finally the private cellars of the Cousiño Macul family. Our tour was small and intimate with just 4 people (one German couple and us) and was conducted in English. Though the tour was informative, it felt very rote and mechanical with pieces of information being parceled out at “specific points” on the tour. It felt more like “work” for the tour guide, rather than “a passion.” We were disappointed as we had hoped for a fun experience. After visiting the cellars we then went to tasting room where we got to taste 4 wines. We started out with a Riesling, followed by a Rose (Cousiño Macul) then a Carmenere (Don Matias Reserva, 2014) and finally a Syrah (Antigua Reservas, 2012). We enjoyed the two reds the most – the Carmenere and Syrah. Not surprising as the Maipo Valley is famous for its red wines. What we liked about the two reds is that they were easy to drink, jammy and full-bodied. 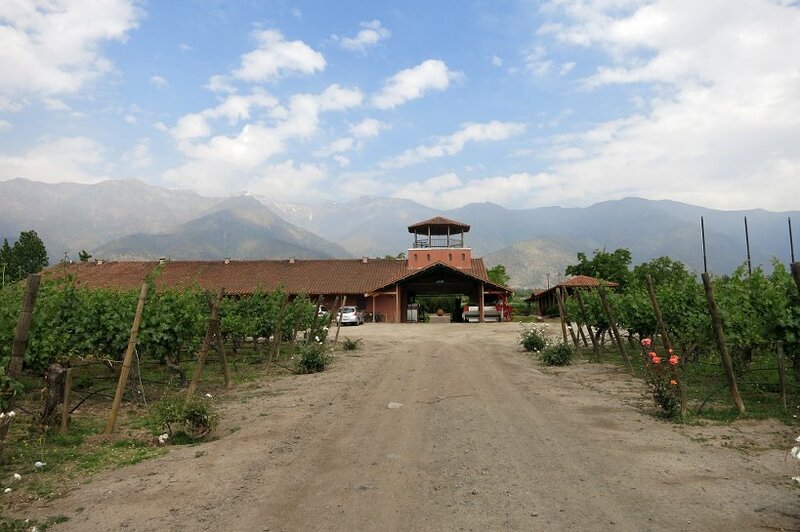 We had high expectations of this vineyard given that it is one of the oldest in the Maipo Valley. It is also still family ran, which gave it a special appeal for us. Tours are offered in several languages (English, Spanish, Portuguese) and perhaps the other tour guides are more passionate than our English guide. Regardless of the tour experience, we enjoyed visiting this historic vineyard and learning more about Chile’s history with wines. Given the proximity to the other vineyards, we recommend taking the day and visiting other wineries too. The Chile wines from Maipo valley are fascinating and numerous. While Chile is the largest exporter of bulk wines into the U.S., the market is dominated by just a few brands. What’s been great about exploring the wines of Maipo Valley is that we have become much more exposed to the diversity of brands that exist. We didn’t have any bad wines, but there were definitely wines we enjoyed more than others. Our favorites were the reds – Carménère and Cabernet Sauvignon. Tip #1: If you want good red wine, especially Cabernet Sauvignon, look for a wine from the Maipo Valley. Tip #2: Look for wines with D.O on the label for better quality. Chilean law requires that the stated grape, vintage and geographical area (Denominación de Origen / D.O.) make up 75% of what’s in the bottle. Tip #3: Go beyond the popular Chilean wine brands in your home country and look for smaller boutique Chilean wines. 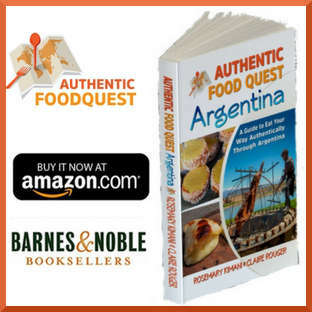 One that exports to the U.S. is Viña Aquitania and it is worth seeking out. Tip #4: We recommend that you call or email the wineries at least 24 hours ahead of your visit to book a tour. You will find their contact information on their websites. Concha y Toro, Av. Virginia Subercaseaux 210, Pirque, Región Metropolitana. Directions to Concha y Toro: Metro Line 4 to Las Mercedes, Metrobus 73, 80 or 81 to the winery. (1h30 from downtown Santiago). Viña Aquitania, Consistorial 5090, Santiago, Peñalolén, Región Metropolitana. 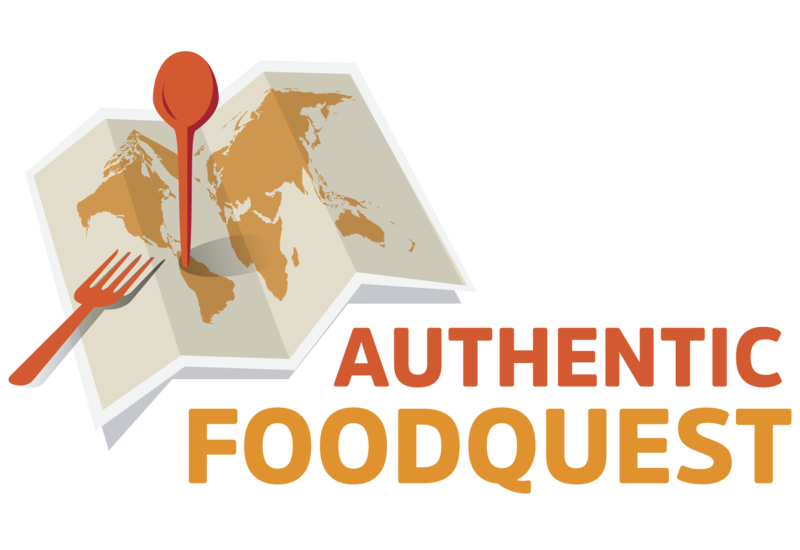 Directions to Aquitania: Metro Line 4 to Quilin, Local bus D17 to the winery. (1h10 from downtown Santiago). 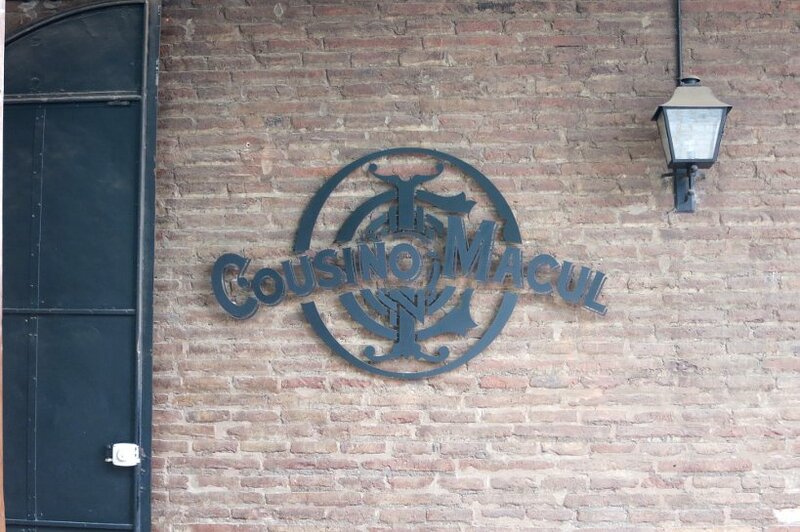 Directions to Cousino Macul: Metro Line 4 to Quilin, Local bus D17 to the winery. (1h from downtown Santiago). Great Post! I love visiting wineries and enjoying learning about wines.. I don’t like being sold to though, I much prefer the ones that are just happy to share their love of it with you. Thanks Toni. Completely agree. The best wineries tend to be the smaller ones who not only have better wine, but better service as well. It was nonetheless interesting to see the operations of different types of wineries in Maipo valley! I had no clue that Chile was a big wine producer. 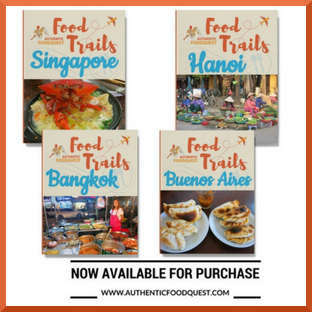 I can’t wait to visit some of these places. Thanks for the recommendations! On a side note, have you ever been to Germany? I would recommend their ice wine. It’s absolutely delicious and by far my favorite wine ever! Awesome post and I can’t wait to read more from you! Thanks Jess for your note. Indeed Chile is a huge wine producer, and we particularly enjoy their Cabernet Sauvignon. Been to Germany before, bud did not have a chance to taste the wines. Good to know about ice wine. Sounds really intriguing!!! Great post. Would love to visit this area. Thanks Amanda. Chile and Maipo valley are definitively worth visiting. Looking back, we wish we had planned for more time in Chile. I love Concha y Toro wine. We drink it a lot here in Panama. So jealous you got to go to their winery! Thanks so much. It was pretty amazing seeing the biggest wine producer in Latin America. They did a great job in trying to make the experience feel intimate. 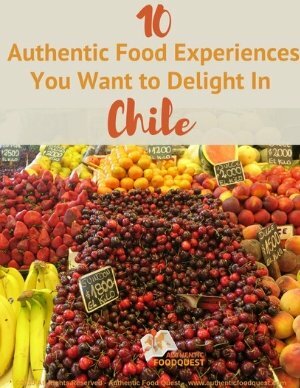 It’s worth checking it out if you find yourself in Chile. Cheers. I love finding new wines. I’m more of a sweet wine kind of girl though. Thanks Leslie. 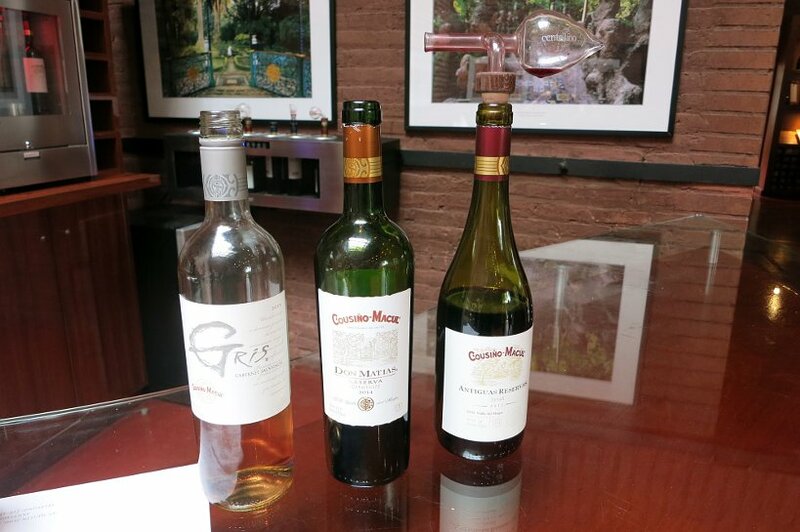 There are also sweet wines in Chile…though we didn’t talk much about them. Undurraga makes great wines and some that are sweet as well. Check them out. Cheers. What a lovely place. Looks like a great time! Great post! I love wine – yet haven’t really been to many vineyards. Trying to pull the husband to go is like pulling teeth. But I will totally be checking out some new Chilean wine once I stock back up again. Will totally make it my year to visit at least two vineyards. Lol. Thanks again! I still need to get into more red wines – usually I enjoy the sweeter whites but have yet to find a great red that isn’t too dry. Thanks again for the tips. That looked like a lot of fun.